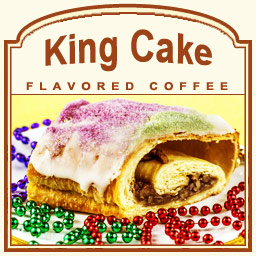 King Cake flavored coffee is a perfect way to celebrate Mardi Gras! Whether you celebrate on Mardi Gras or want to keep the party going year round, look no further than the King Cake flavored coffee and its apple, sweet honey, and cinnamon danish characteristics. 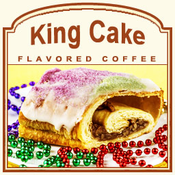 With only 2 calories per cup, this delicious King Cake coffee features flavors that will make you feel like you�re indulging in a delicious pastry. With 100% Arabica beans, this heat-sealed valve bag will hold the freshest coffee possible. Roasted and shipped on the same day, this King Cake flavored coffee features a full gourmet flavor that will make your mouth melt with its creamy, cinnamon flavor that is infused with subtly sweet apple sweetness.